It’s the carved or embossed wood that caught me, and the exaggerated vertical line. This sconce has presence, and I liked that. 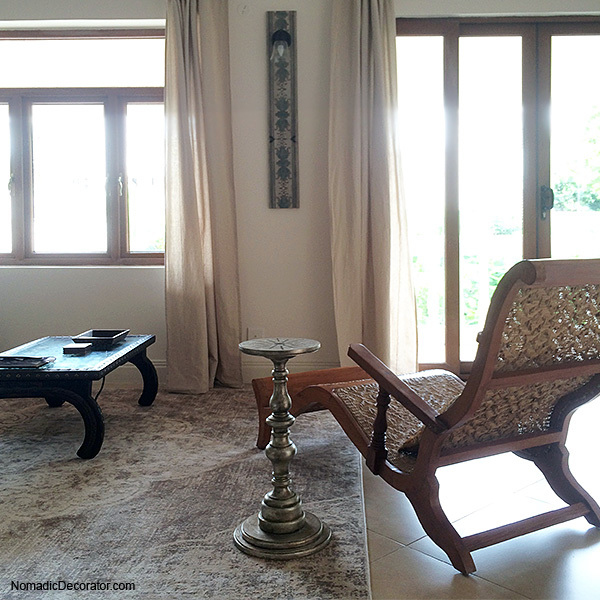 In the India pied-a-terre’s living room, there are two large windows with a sliver of wall in between. And there was electrical provision there for a sconce. 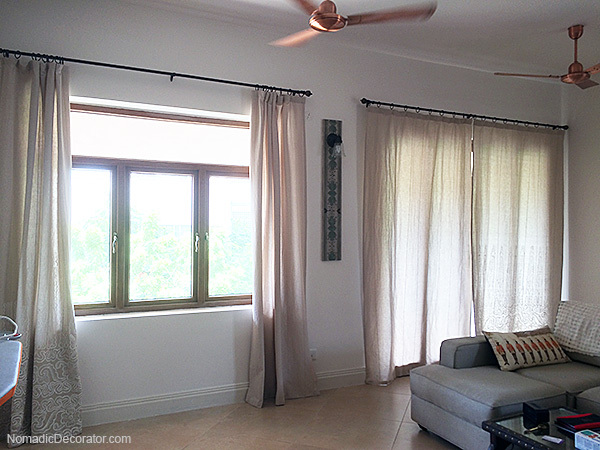 What is perfect for a space like that? 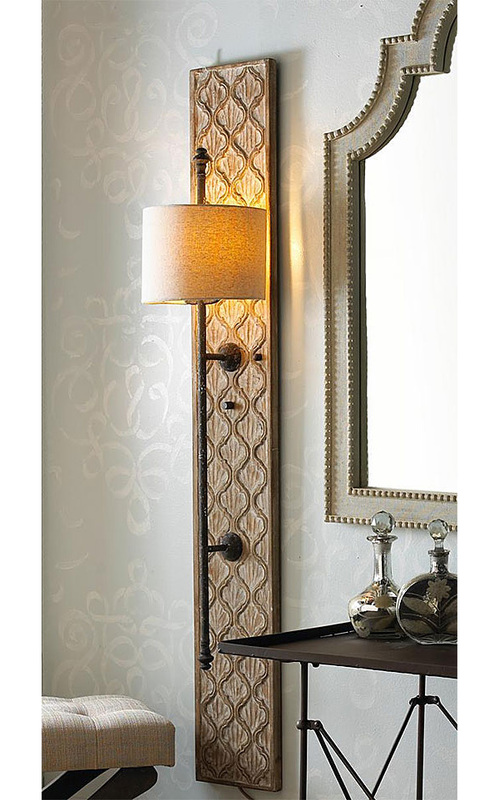 A long vertical embossed wood sconce like this! 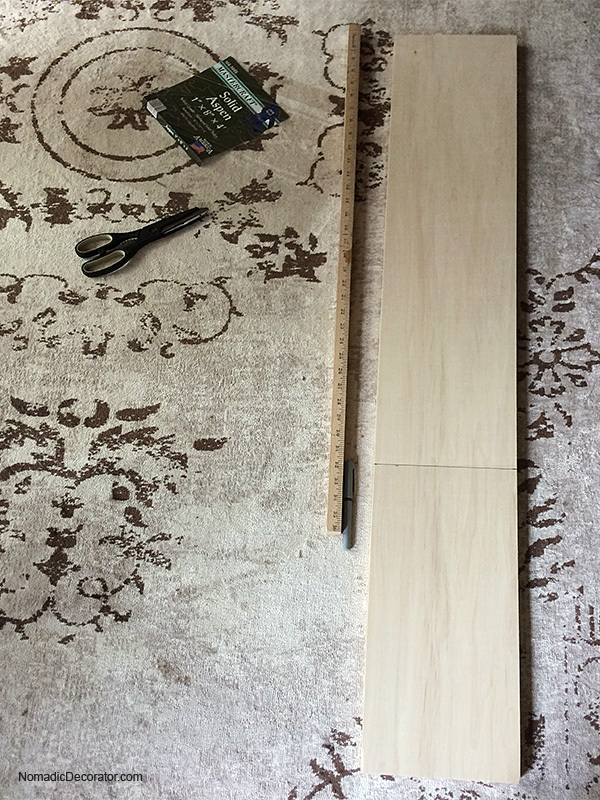 I bought a 48″ length of wood, but the wood needed to fit in a suitcase to go to India. I measured the space in our longest suitcase, and cut the wood down to 31″ — the max length that would fit in the suitcase. I custom made the stencil. 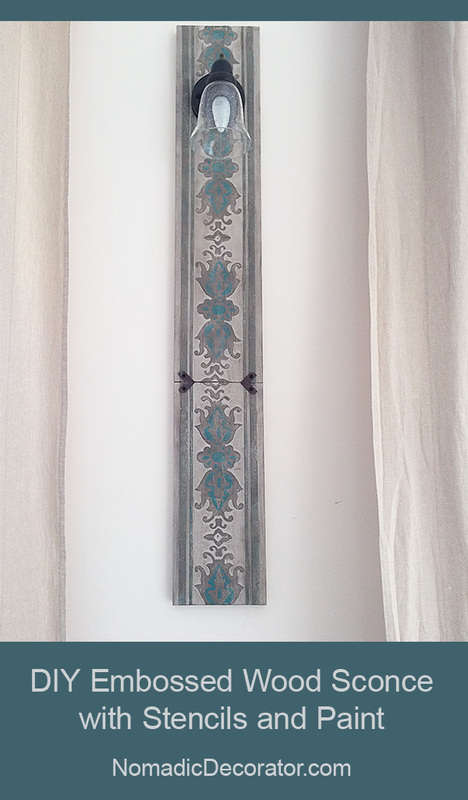 The stencil pattern came from a wood printing block from Jaipur. 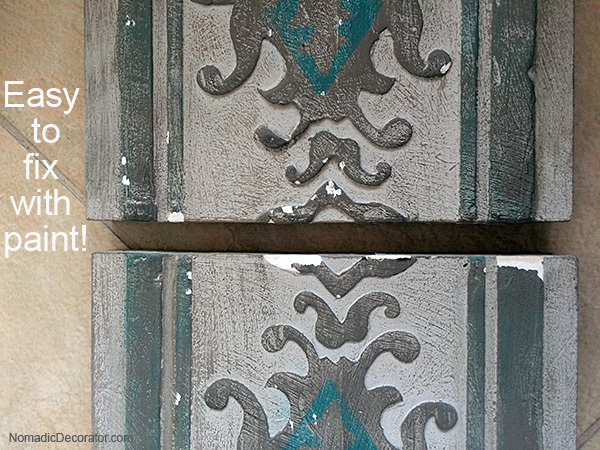 That is a whole ‘nother DIY process I’ll share in another post! When I saw this printing block on eBay, I saw it on the wood sconce, and that was that! The stencil was cut with a Cricut Explorer in mylar thin enough to cut, but thick enough to hold up to being slathered with joint compound. I used joint compound because it was in the basement, left by a contractor who was fixing walls. 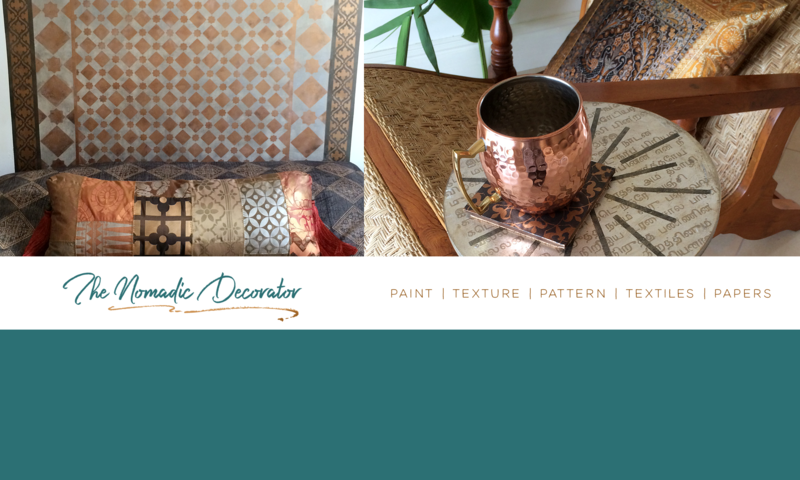 You can use any material that will create raised texture. 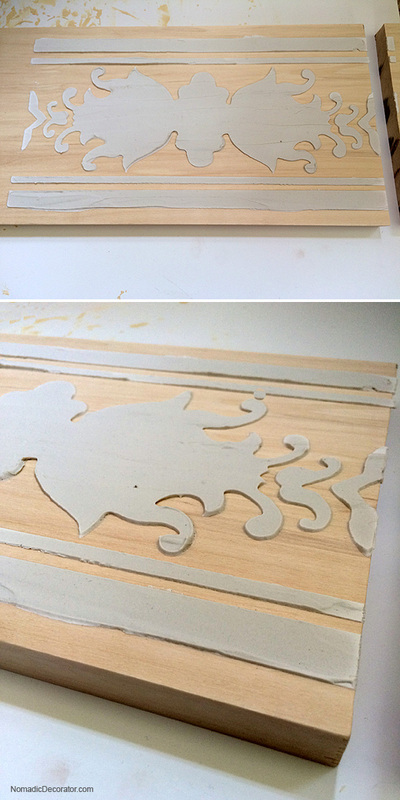 I laid the stencil on the wood, and spread the joint compound like frosting over the stencil. I laid it on pretty thick, because I wanted a good noticeable raised pattern. 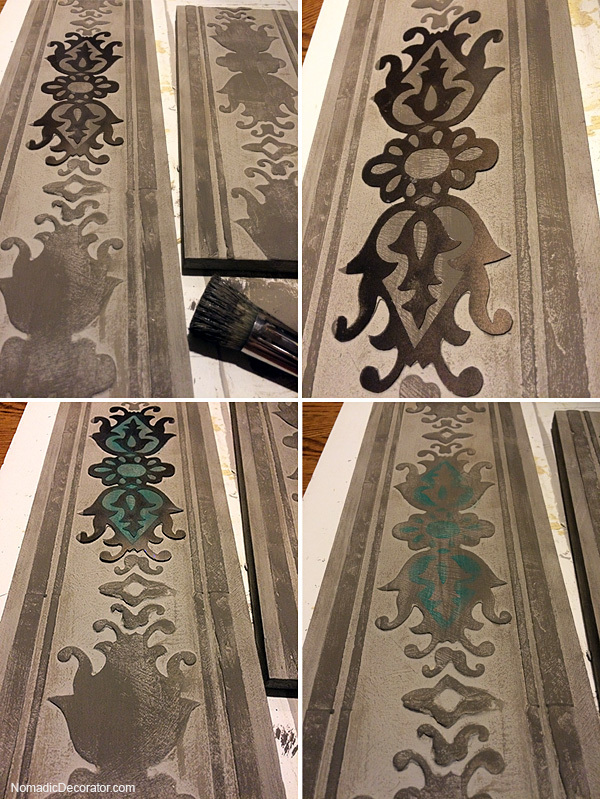 To make the pattern, before the joint compound dries, carefully lift the stencil straight up. You can see in the above pictures, some areas are really messy. When the joint compound was half-dry, I simply put the stencil back over the design and applied more joint compound to build it up and smooth it out. Let the joint compound dry. 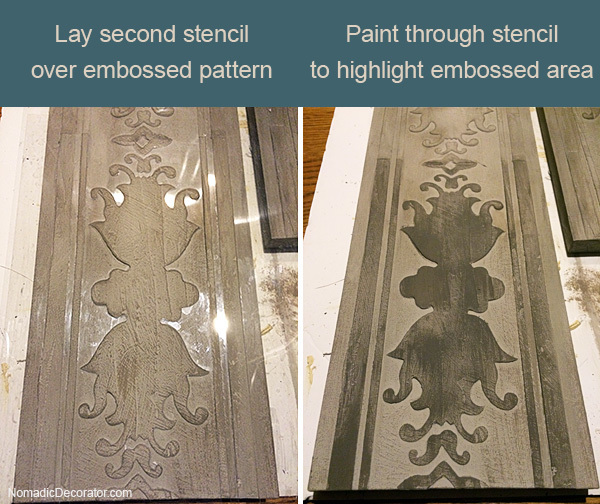 If you need to make repeat patterns, lay the stencil down after the joint compound is dry enough that it won’t smoosh. (A more technical term than squish!) Don’t worry about subtle ridges. Use fine sandpaper to smooth the joint compound if needed. I did not sand perfectly because I wanted my board to have the feel of old dinged up hand-carved wood. After everything is dried and sanded, you can paint. Fun time! 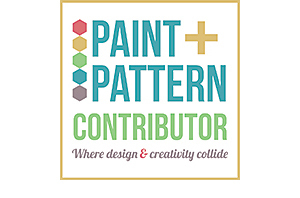 I chose chalk paints – a mix of Annie Sloan paints and Americana Decor — because I wanted a matte chalky finish. Sorry for the poor light quality. I was painting on the kitchen floor at 3 a.m. after a cat woke me up for food. So rude! I dry brushed several natural colors of chalk paints to make variations in color. As you see in the above photos, I first painted the lightest color of chalk paint, then I dry brushed the darker colors. I decided some dark areas were TOO dark, so then I dry brushed the lighter paint over the dark paint to tone it down. So don’t worry, if something doesn’t turn out the way you want, it’s just paint. You can paint over it. 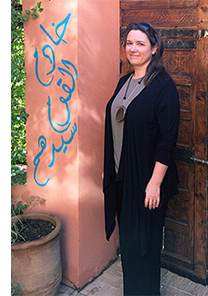 The stencil is a two-part stencil, so it has two pieces to make the design. 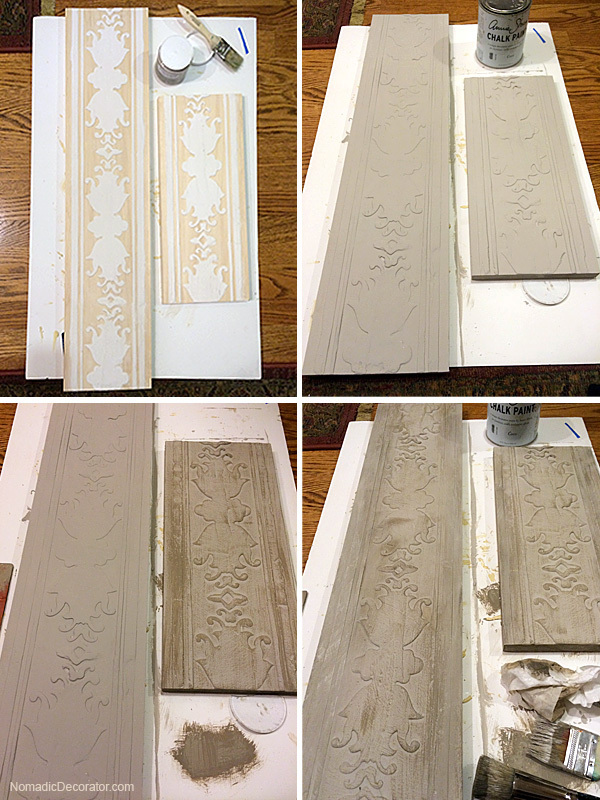 I used the first layer of the stencil to make the embossed pattern with the joint compound. 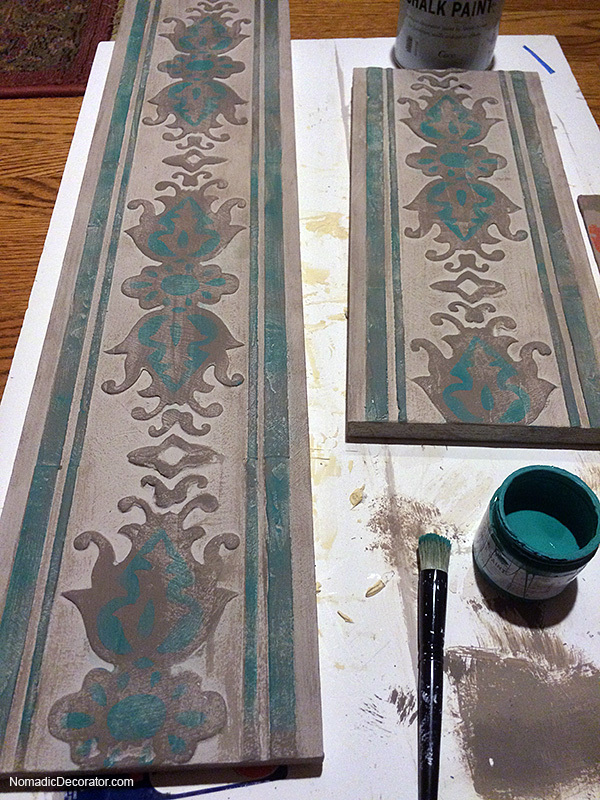 Then I used the second layer of the stencil to paint a pattern with the gorgeous blue Florence color Chalk Paint by Annie Sloan. 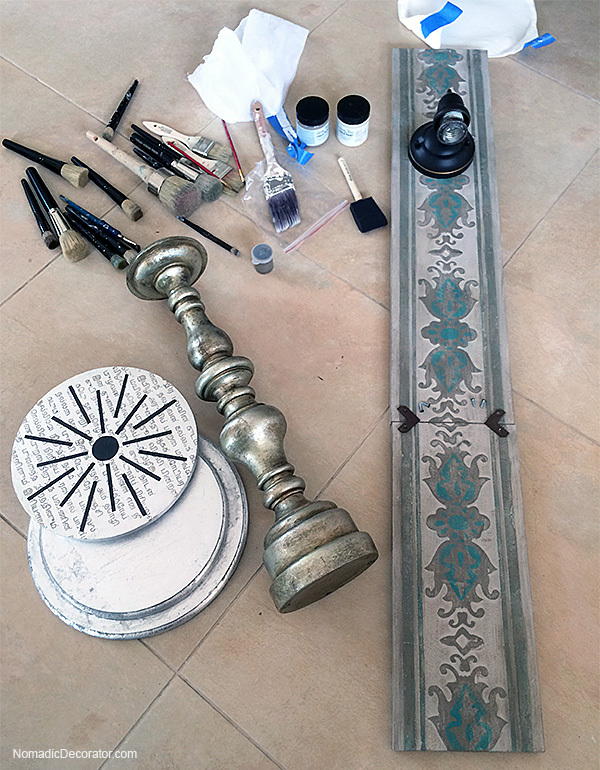 I lightly brushed natural chalk paint colors over the Florence to tone it down and make everything look old and dusty. Then, I packed the boards in a suitcase! The next steps happened in India. Our electrician and carpenter helped with placement of the wood boards on the wall. We used my iPhone leveling app to get the board level. The carpenter drilled a hole to install the Home Depot sconce over the board. He screwed the wood boards directly to the plaster wall with two screws. All the handling caused some chips that I fixed with paint. Yes I took chalk paints to India. I don’t think the Home Depot sconce is the 100% ideal look for this wood board, but I was running out of time before our trip and was seeking an affordable sconce. It comes with a frosted glass shade. That wasn’t the look I wanted, so for $7 I got a seeded clear glass shade, all nice and bubbly! We still need to find a clear bulb. According to the electrician, “there are no more clear bulbs of this shape and size left in India.” ??? You can see here with the width of the room and the large windows, the little Home Depot sconce by itself could look lost on the wall. But with the embossed wood, it has turned into an art piece that people notice and ask about.